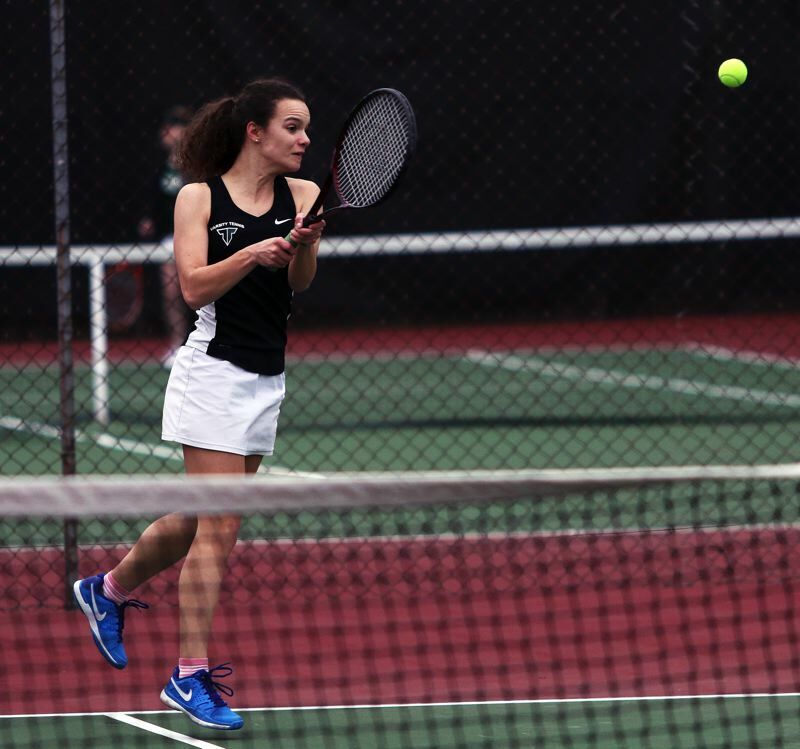 BEAVERTON — Something was finally able to slow down the Tigard High School girls tennis team. No, it wasn't some big-name opposing squad. It was Mother Nature — more specifically, the rain. The Tigers, looking to move to 4-0 on the season, had their match with Beaverton rained out near the midway point of the contest, when the teams met in a non-league match held last Thursday at Beaverton High School. But even the wet weather, which sent players from both squads scurrying for cover, could put a damper on Tigard's impressive start to the season. "It's been great," first-year Tigard head coach Kelsey Wahl said. "I've been pleasantly surprised with everyone. We lost a lot of seniors from last year, but this team has been very united and supportive." "It's going really well," said Victoria Liu, who is one of four senior captains for the Tigard team. "I'm so proud of our team. We've got awesome coaches who really support us. I've really been enjoying it." "It's been so exciting," senior captain Erin Griffiths said of the team's 3-0 start. "The coaches have been great, and everyone is so nice. That really helps a lot. Everyone is so supportive." Freshman Lizzy Stevens, who has been playing at No. 1 singles, and sophomore Nicole Mazzeo, who has been at No. 2 singles, have come up big for the Tigers early in the season. But neither Stevens nor Mazzeo were available for last Thursday's match at Beaverton, meaning that Tigard had to adjust its line-up — and many of the Tigers didn't miss a beat. Liu, who usually plays at No. 1 doubles with fellow senior Malory Olsen, moved up to play at No. 1 singles in the contest at Beaverton. And, when the rain halted play, she was leading Beaverton's Lauren Lim 6-2. "It went really well, even for a rainy day," Liu said. "It was different, playing singles." Tigard's Nicole Neal and Rachael Schmidt picked up a 6-4, 6-1 win over Beaverton's Olivia Cartrell and Nina Ham before the rains hit their No. 3 doubles match. At No. 2 doubles, Tigard seniors Jaymi McNabb and Juliette Tisseur were leading Beaverton's Nailey Poppleton and Kate Harvey 6-1, 3-0 when the rain stopped play. Prior to the match at Beaverton, Tigard posted a 7-1 win over Southridge in a non-league match held March 22 at Camille Park. Stevens, at No. 1 singles for that contest, rolled to a 6-0, 6-0 win over Southridge's Jessie Nguyen. "Lizzy is so strong at No. 1," Wahl said. "And that lets the others play where they're more comfortable. And she's such a good teammate." Mazzeo, at No. 2 singles, scored a 6-2, 6-3 win over Hannah Maung. At No. 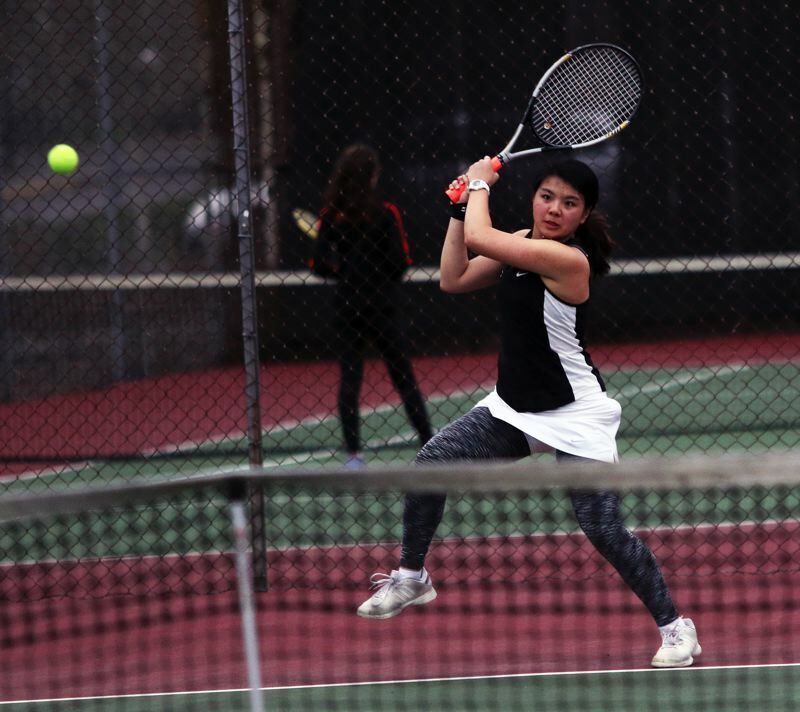 3 singles, Tigard junior Lucy Yusem scored a 7-6, 6-4 victory over Analisa Lo. The Tigers swept all four doubles matches against Southridge. At No. 1 doubles, the team of Liu and Olsen got a 6-3, 6-2 win over Hasol Yu and Ammel Sawan. At No. 2 doubles, Tigard junior Nikki Yusem and Tisseur defeated Diana Yu and Meg Tam by a 6-3, 6-2 score. McNabb and Neal, at No. 3 doubles, downed Sofia Pastor 6-3, 6-2. In the No. 4 doubles match, the Tigard team of seniors Marine Grall and Paula Boned picked u a 6-1, 6-3 victory against Noor Bargouti and Tram Do. The Tiger girls will be back in action on Monday, when they play at Aloha in a non-league match starting at 4:30 p.m. Tigard will open its Three Rivers League schedule on Wednesday, when it travels to Tualatin for a 4 p.m. contest.